Mike, the kids and I have now gone to Luigi’s for dinner twice – once, in May 2012, when coming back from the Redding area after watching the amazing lunar eclipse, and more recently, last November, when coming back home from Oregon. Both times we had quite a good meal. There are two words to describe Luigi’s (OK, maybe they should count as tree): cheap and large portions. Indeed, Luigi’s has the largest variety of pizza sizes we’ve ever seen. You can get a 10″ mini – but also a 30″ “Big Luigi”. It’s big enough for a large crowd. I can’t recall exactly what we’ve had in those two occasions, but I know we’ve sampled both the pizza and the pasta and we’ve been happy with both. The pasta seems freshly made (but I’ve only had their beef ravioli, $4.60), their huge meatballs are quite tasty and the pizza features fresh ingredients. There is another pizza restaurant in Red Bluff I want to try, but this one is conveniently located by the freeway and easy to find, so I’m sure we’ll stop by again. I am not Marga I am Mika her ten year old daughter and I think Papa Johns is amazing, their crust is soft and fluffy, it has yummy cheese and wonderful sauce I have no idea why my mom would write such plain reviews on them I would give them a million stars if the rating chart went up that high. I can’t stop eating their pizza and the slightest whiff of it is mouth watering! Their pizza is sweet and savory at the very same time, I give them a thumbs up to building more and more pizzerias and over the entire pizza businesses in the worlds! I want pizza now! Thanks and keep eating Papa Johns pizza! Tuesdays are a hard dinner day for me. The kids have classes until late, so we don’t get home until 5:30, and then Mike has to go and rush to make it to his School Board meetings. While I love cooking, I don’t like cooking when I’m rushed and I don’t particularly want to cook just for the kids and I (if I make what they want, I won’t be happy, if I make what I want, they won’t be). So often times, if we have no leftovers, we rely on take out or frozen food. Last night was one of those nights, so I headed to Grocery Outlet for some frozen pizza. Generally, Grocery Outlet has tons of choices, but this time they were more limited. The kids only like cheese pizza, so I went for this California Pizza Kitchen version. I’d had the CPK frozen pizzas before, and I’d liked them. Well, so did the kids. While they still prefer take out pizza, they were perfectly happy to eat this one. We got the version that comes with the flat bread appetizer, and the kids pronounced the bread the “best bread ever”. It’s pretty good, and it tasted garlicky to me, but I didn’t tell them that :-). I didn’t try the spinach artichoke dip as that’s not my thing. This pizza was available at GO for $4. It’s think crust, so it pretty much only fed my two hungry kids. For me, I got a Bellafoglia pizza with a bunch of toppings ($4). I’d never heard of the brand, but I’m glad I gave it a try. This was by far the best frozen pizza I’ve ever had. The cornmeal crust had a lot to do with it, it was just crunchy enough, just salty enough and just very good. The cheese and toppings were good quality and were well balanced. I did some research when I came home, and found out that Bellafoglia is a product of Hayward’s Pacific Cheese Co. a cheese supplier. Sizewise, this pizza may be enough for two adults, but probably if they eat a salad or something else as well. I ate half of one, and was hungry later in the evening. In all, I think I’ll keep a few of these pizzas in my freezer for nights just like last’s. With the kids out of town I haven’t been cooking as much as I normally would, which means I’ve been relying on whatever frozen food I find at Grocery Outlet. 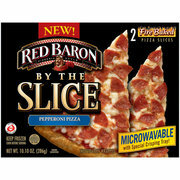 That’s very much of a hit and miss, but as far as frozen food goes, Red Baron by the Slice Pepperoni Pizza ($2 at GO) is a hit. The pizza slices come in their own baking trays, so all you have to do is take them out of the plastic and put them in the microwave for 2 1/2 minutes. Unlike most other frozen pizzas, these slices actually crisp up. They have a medium crust, light tomato sauce, enough real cheese and pepperoni. 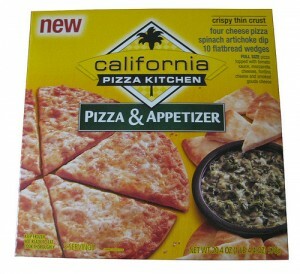 They are pretty tasty, not pizzeria quality, but quite good for frozen pizza. At 360 calories and 15 grams of fat they’re not great for you, but they could be worse. In all, not a bad choice for lunch. Note: the box offers two ways to cook it, I went for the simple one, it may be even crispier if cooked the other way. Papa Johns has become our default pizza joint. We find the pizza to be good enough (no worse than what you can find at most San Leandro pizzerias and perhaps even better) and the fact that it’s 1/2 a block away from our house, so we can easily pick it up and thus avoid a long wait (pizzas are usually ready in 20 minutes) and delivery charges is very attractive. They no longer have the great deal that they had when they opened, but they usually have a deal that makes the pizza substantially cheaper than regular menu prices. You can find these deals both at their website, when you go order, or on the flyers that come with the mail. I’ll post some of the deals below as well. I prefer ordering online, as it’s easier and the prices are lower. As I mentioned in my last posting, a Papa John’s Pizza joint has opened at the former Peewee’s site. We were out of food last night, so we ended up checking it out. The conclusion: it offer mediocre pizza, but, right now, at an unbeatable price. We got an x-large pizza, half with extra-cheese and ham, and half with a bunch of meats, cheeses and pineapple. The pizza dough was fine, not too chewy, tasty but not particularly so. The sauce was a bit sweet, but not overwhelmingly so. The cheese was fine, but not very flavorful. The main problem with the pizza is that Papa Johns puts the toppings underneath the cheese, which means that they slide off the pizza very easily, taking the cheese with them. So it’s a bit messy to eat. In all, it tastes OK, but it wouldn’t be my first choice if 1) it wasn’t so cheap (right now) and 2) it wasn’t just across the street from my house. As for the prices, the regular prices are quite high. A 16″ specialty pizza will cost you $21. But right now they have a deal where you can have such pizza for only $12. And, if you order an extra-large pizza at whatever cost, you get a free three-pack of It’s It ice creams. So yeah, it’d be hard to find a better deal. Delivery, btw, is $2. In conclusion, I’ll probably order pizza from Papa John’s while they are having this deal, but I won’t when they stop. BTW, I ordered online and it worked perfectly. We haven’t gone to Mountain Mike’s in several years. While the pizza is probably the best in town, it’s more expensive and the buffet has gotten expensive for our family of four. But last night we were sans kids, but not for long, so we headed back there for their Wednesday night buffet (now about $8.50 per person, including soda). The place and the buffet is pretty much identical as when I wrote my original review in 2006, though they have more video game machines now. Still, other families have probably concluded the buffet is not that great of a deal, as there weren’t any kids there last night. Once again, I liked all the pizzas. I finally got to taste a bar-b-q chicken pizza, which I never had before because the concept is not that appealing, but it was surprisingly good. So was the pizza (can’t remember what toppings it had) that came with a garlic sauce. It was definitely a winner. The cinnamon dessert pizza wasn’t as good as I remembered, but it was still quite yummy. Finally, they now have mixed greens in the salad bar. A few weeks ago I got a flyer from Mountain Mike’s Pizza advertising their “all you can eat” buffet Wednesday nights ($6.50, 5-8 PM), and a couple of weeks later it came to mind when I was trying to figure out what to do for dinner. Eda, our friend Arthur’s mom, was in town so we quickly arranged to meet her and the kids there. It was a good plan. 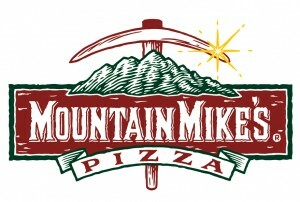 Mountain Mike is a chain, but doesn’t really look like one. It could really be your neighborhood pizzeria, and I think that’s what it strives to be for the Marina district. It has recently undergone a renovation, so the place looks clean and now there is a separate dining area towards the back. There are still a couple of video game machines to keep the kids occupied. But the pizza is what matters and the pizza was good. All of their specialty pizzas were available – albeit not at the same time -, cut into slivers so that you can taste many of them, and all the ones we tried were very good. The all-meat was too salty for me, but I equally enjoyed the vegetarian, the pineapple chicken luau and the other types. The crust was on the thin side, the cheese was cheesy and the toppings were generous without being overwhelming. Everything tasted like good qualities (relatively speaking, of course) ingredients. Their “dessert pizza”, a cinnamon-toast tasting pizza, was out of this world, specially as it was served very hot. The buffet also included a salad bar. There were no fancy lettuces here (too bad, ’cause that’s the only type of salad I eat) but they had pasta salad and potato salad, as well as the fixings for your run of the mill salads. Other people seemed to enjoy them. At $6.50 for all of this it’s a great deal – and the pizza is good enough that we will order from Mike’s next time we want pizza. Note that they don’t have free delivery, however. Zachary’s Pizza has, without doubt, the best pizza in the Bay Area. Indeed, probably the world. I’ve never really had pizza in Chicago (whose pizza Zachary’s tries to imitate), but I just can’t imagine how it could be any better. Zachary’s offers two types of pizza: thin and stuffed. I have never had the thin pizza and I never will (that would seem to me to be a waste of a visit to Zachary’s), so I can’t comment about it. The stuffed pizza, however, is heavenly. What you get is more a cheese pie than a pizza. A bottom layer of dough is covered with tons of cheese (but I always order extra-cheese anyway) and toppings and then topped by another layer of dough. This whole thing is covered by stewed tomatoes. The description, however, doesn’t do justice to the result. You really need to try it to know why it rocks. Zachary’s has two locations, one on Solano in North Berkeley and the other in Rockridge. They both have an eat-in section which are fairly nice. The walls tend to be decorated with children’s drawings of Zachary’s pizza. Getting a table is usually very hard, specially during peak eating hours. You have to be prepared to wait (or go, put your name down and stroll through the neighborhood). They don’t take reservations, but you can pre-order your pizza when you put your name down, so that it’s ready once you your table is ready. What we usually do is get take-out (Zachary’s doesn’t deliver, it also doesn’t take credit cards, it’s a cash-only place). We live a 20-minute drive away from the closest Zachary’s (the one in Rockridge) but the pizza is still warm by the time we get it here. My favorite pizza is the plain cheese (with extra cheese), though last time we had one with Canadian bacon and pineapple that was also very yummy. Mike prefers the ones with toppings. His favorite is the Mexican chorizo, a spicy pizza with green chiles and Monterrey Jack cheese. We had both of these last Thursday night and we were all very pleased. A large pizza has 8 slices. We usually each eat two slices for dinner or one for lunch. It usually takes 40 minutes for the pizza to be ready so order accordingly. I’ve found that the leftovers microwave well, but make sure not to overheat it. I use 2 minutes on high but I have an old microwave. 2011 Update It’s been 20 years since we started going to Zachary’s pizza (and 7 years since my review) and Zachary’s continues to make wonderful, delicious stuffed pizza. From time to time they add more varieties to their menu and prices, of course, go up. Last night we had their Carne stuffed crust pizza ($28 for a large), which comes with Italian sausage, pepperoni, salami, chopped bacon and mozzarella. It wasn’t my favorite. There were too many toppings, they were too salty altogether, and they didn’t let the flavor of the cheese shine through. It was still a great pizza, but not as good as their plain cheese pizza (still my fave). Zachary’s has added a new location in San Ramon now, which we haven’t been to. They take reservations there.